Mjølkevegen (the “Milky Way" in Norwegian) offers various cycling routes through the heart of Norway's lush mountain highlands. As you don your bicycle helmet by the large, clear meltwater lake Vinstre, Jotunheimen's enormous mountains rise in the background. The unforgettable view is a breathtaking invitation to an equally memorable ride. The Valdres valley is located in the middle of the mountain highlands, just south of Jotunheimen. It is home to a bicycle route of 250 kilometers that goes from Vinstre, at around 1,000 meters above sea level, to Gol at 200 meters above sea level. The route, which is called Mjølkevegen ("The Milky Way" in Norwegian), is situated 1,300 meters above sea level at its highest point. The name is not a reference to our galaxy, however – it rather comes from the dairies that use the route to collect milk from the many free-range dairy cows in the highlands. Going through rolling hills and expansive stretches of grass, it is no wonder that this is one of Norway's most popular cycle routes. The peaceful, slow moving cows who share the road with you sometimes are a nice part of the cycling holiday, but also something to keep in mind when your bicycle starts to pick up speed. You will also see many goats, but they tend to stick to the hillier terrain. Although Valdres is at a high altitude and latitude, the climate stays mild and sunny throughout the summer, so do remember the suncream. Maps will show the path as going downhill all the way, but as you pedal along you will find that the landscape is much more varied. Mjølkevegen has a mix of demanding uphill climbs, dizzying downhill runs, long continuous stretches sweeping over open terrain past glittering lakes, and even occasional patches of forest at the lowest elevations. Occasionally, the route offers challenges that will delight diehard cyclists – but it never gets too challenging for a casual rider. It is also worth noting that there are equally good options to begin your route in the south, for example in Gol, and ride towards the north instead of vice versa. It is no more or less hilly and challenging that way. An open mountain landscape, grand views, cute sheep, friendly hosts and home-cooked meals are a few reasons to give Valdres a chance on your next cycling holiday. Read more about cycling in Valdres. If it is the sun itself that causes perspiration more than the rides, make sure that you do not break a sweat from worrying about where you or your suitcases are staying. Tour operators have prepared a smorgasbord of packages that divide your trip into appropriate stages with both accommodation and luggage transportation included. Spend your days enjoying the surroundings and your exercise, completely worry free. All hotels serve breakfast, and usually offer packed lunch options for your continued journey through the cycling universe of Mjølkevegen. On the mountain lake Brygdin, you can combine your bike ride with a ferry trip that has been around for more than 100 years. The M/S Bitihorn ferry has sailed the same route across the lake every day since it first launched in 1912, giving tourists a unique view of Jotunheimen's towering mountain peaks reflected in the clear waters of the lake. When you think of accommodation in Norway you may very well think of rustic cottages. They are waiting for you in beautiful locations throughout Valdres, but so are more modern comforts if that's what you prefer. At various places along the route, modern luxury hotels can give you the rest you deserve after a day's pedaling, so come wash that dirt off and cool down in a gorgeous spa or swimming pool. Find yourself a place to stay. While dining at a restaurant it is recommended to try rakfisk - a delicacy usually made of trout, prepared similar to smoked salmon in a kind of brine. It is an appetizer that most fish lovers will be glad to savour. Valdres is best known for its rakfisk, but the area has a number of other culinary specialties that curious cyclists will enjoy sampling. This is especially true of smoked meats such as kurv, a type of sausage. 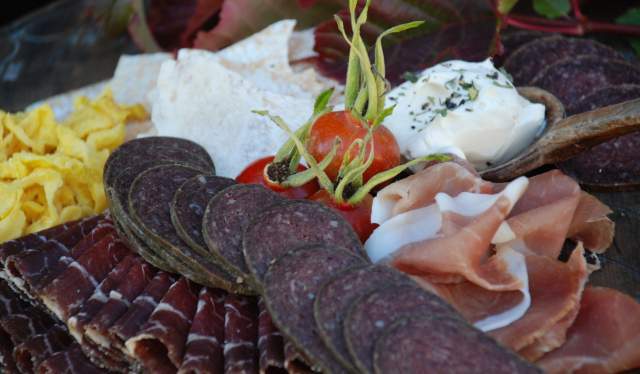 Other treasured specialties are different kinds of deer meat, white cheese, brown cheese, and goat cheese. 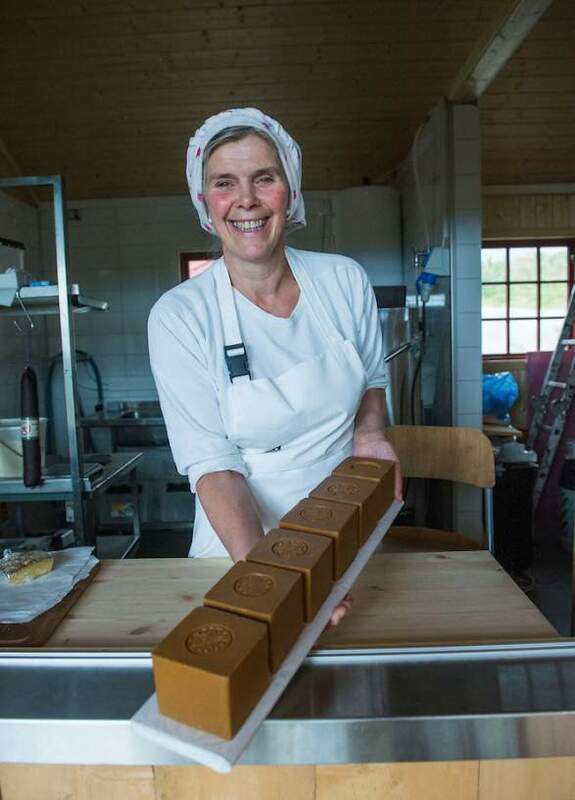 The Norwegians are crazy about their brown cheese, most often made from a mixture of cow and goat milk - and they love sharing it with others. Read more about Norway&apos;s food traditions. However, if you are in the mood to keep your adventures on the road and not on your plate, rest assured that all menus will also include recognizable international favorites. If for some reason you choose not to try the many dairy products that have given the bike route in Valdres its name, you should at least give this last recommendation a try. Norwegians have developed an interest in micro-brewing over recent years, so plan to wash down your meal with a good, cold beer. Stølsliv is a special form of agriculture in the Norwegian mountains. The cows, goats, and other livestock are out on the “støl” (similar to a pasture) eating grass and frolicking all summer, usually within easy walking distance from the farm. Some farms are open to visitors, who can buy “støl-food” – homemade cheese, flat bread, and special regional pancakes with sour cream. According to National Geographic, the Besseggen ridge is one of the top 20 hikes in the world. Not surprisingly, it’s located in Valdres - the home of some the most spectacular mountains in Norway. Enjoy the view from the top of Norway’s highest mountain Galdhøpiggen, walk along the narrow, but popular Besseggen ridge, and try some of the traditional food from the area.